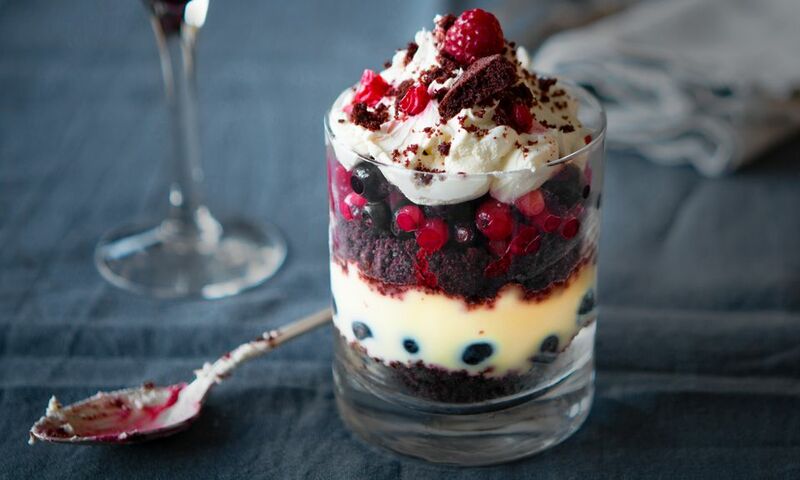 You can make this super-tasty trifle full of berries, whipped cream, custard and thick slices of soft red velvet cake less than half an hour. The beauty of the cake is you can make the best of fresh fruits and berries when in season, or frozen when not. It's a year-round treat for sure. A mixture of berries works wonderfully well with the chocolate flavor of the red velvet cake. Use what you have: raspberries, blueberries, blackberries, and strawberries all taste delicious. If you are in a hurry you can always use a ready-made red velvet cake for speed but homemade will still taste best, and it is so easy to do. Fill the trifle will creamy, fresh custard sauce which adds another layer of yumminess, again making custard is easy or again use shop bought if you are short of time. Make This Amazing Cake With Just 5 Ingredients! Gather your ingredients and preheat the oven to 360 F. Line a large baking sheet with parchment paper or a silicone baking mat. Put the butter, sugar and the vanilla extract into the bowl of a stand mixer (you can use an electric hand mixer, or a wire whisk to mix by hand). Beat for at least five minutes until the mixture is pale in color and light and fluffy in texture. Add the egg and beat again, finally add the buttermilk and mix thoroughly. Sift the cocoa powder, flour, baking powder, and soda together, then add to the mixer bowl and gently beat into the butter mix. Finally, add the red food gel. If the color is not strong enough, add a little more until you reach the desired color making sure to only add the tiniest drop at a time, the gel is potent. Oil the parchment and use a palette knife to spread the cake mixture into a 10- to 12-inch circle. Cook the cake in the middle of the preheated oven for 10 to 12 minutes until slightly firm to the touch in the center. Remove from the oven and leave to cool for 5 minutes, then transfer to a cooling rack until cool. Choose your trifle serving dish, either 4 individual glasses, or one large dish. When the cake is cool use a sharp knife, to cut the cake into circles to fit the glasses or dish. Aim for at least two slices for each. Hold onto the leftover crumbs as these will be for decoration. Place one slice in the dish and cover with a generous layer of mixed berries. Pour over a layer of thick custard, then another layer of cake followed by berries again. Finish with a layer of whipped cream and garnish with fruits and cake crumb. To serve: if you are using frozen berries, put the trifle(s) into the refrigerator and leave the berries to thaw slowly in the glass. They will give off some juice which will soak into the cake, making it even yummier. Fresh fruit trifles can be served immediately or stored in the fridge covered with plastic wrap until needed.